I am rarely sick. I know this has to do with my genes. But I wonder if my basic overall good health has anything to do with my morning routine. Every morning, I get up, drink coffee, and write about my life. I started this more than 15 years ago, a la Julia Cameron’s The Artist’s Way. Studies have shown that daily writing about stress, anxiety and trauma boosts your immune system. Writing and art is good for the soul. And maybe the arts are good for the body too. 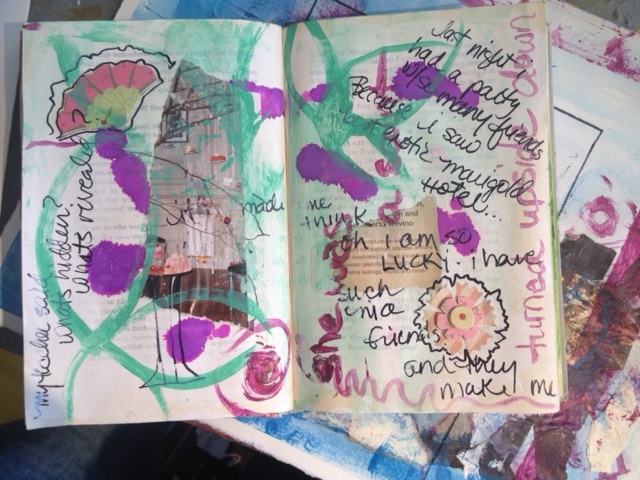 Since January, I’ve not only been writing longhand in a spiral notebook, but I’ve been updating my art journal. I am repurposing the hardcover book, The Rules of the Game by Georges Simenon. The library was discarding this book. The paper in a hardcover is much lovelier than in any spiral bound notebook. For me, the challenge is that the words are already there. Sometimes the words hinder and sometimes they help. Sometimes the words peek through and sometimes I paint over them. One of my darlings has strep throat. Of course now the whole family feels a little sick. Even me who never gets sick. I think I will take two aspirins and write or paint in my art journal. To learn more about making an art book, link to Effy Wild’s Book of Days.